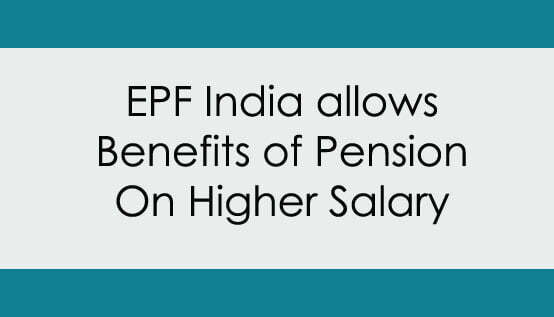 EPF India issues the orders for higher pension benefits to EPF 95 members. As per the the Employees Provident Fund Organisation circular Pen-1/12/33/96/Amendment/Vol.IV/16762 dated 22.01.2019, EPFO allowing members of EPS 95 the benefits of pension on actual salary as per the orders of Hon’ble Supreme Court of India in the matter of R.C. Gupta & ors. Vs RPFC, EPFO & Ors. In SLP No. 33032-33033 of 2015. Under the EPF Scheme 1952, contribution on wages higher than the statutory wage limit is dealt under Para 26(6), As per this Para, for provident fund contribution on higher wages, joint option of employee and employer is to be submitted and the same is required to be accepted by EPFO. However. if an employer and employee have contributed under the EPF Scheme I 952 on wages higher than the statutory wage limit without joint option of employee & employer and the EPF Account of the concerned employee has been updated by EPFO on the basis of such contribution received then by action of employee employer and EPFO. It can be inferred that joint option of employee and employer has been exercised and accepted byy EPPO, therefore in such cases for implementing the directions issued vide Head Office Circular Pension-I/ 12/33/EPS Amendment/96/V ol.Il/34007 dated 23-03-2017 formal joint option of employee and employer should not be insisted. As per the Proviso to Para 11 (3) of EPS. 1995 (as it stood prior to amendment of EPS, 1995 w.e.f 01-09-2014) joint option of employee and employer was required for remittance of contribution on wages higher than the statutory wage limit for treating such higher salary for the purpose of pensionable salary. Therefore to implement the directions given under H.O circular dated 23-3-2017, joint option of employee and employer for remitting contribution under EPS 1995 on wages higher than the statutory wage limit is required and however it has come to the notice of Head Office that in respect of some establishments, pension contribution on higher wages was already remitted in to the Pension Fund at the relevant period of contribution prior to 01.09.2014, where in such cases joint option of employer and employee need not be insisted for. With effect from 01-09-2014, the provison to Para 11(3) of EPS 1995 has been deleted and Para11(4) has been added to EPS 1995 Para 11(4) provides an option to those members of EPS 1995 who were already contributing to the Pension Scheme on actual salary to submit fresh option within prescribed time limit to continue to contribute on actual salary. lt also specifies that such members shall have to deposit an additional contribution into the Pension Fund at the rate of 1.16% of salary exceeding Rs.15000 from and out of contributions payable by the employees for each month. However, for period prior to 01.09.2014, there is no such provision in EPS 1995 which requires the employees who opt to deposit contribution at actual salary to deposit any additional contribution as specified above. So all the concerned are directed to accordingly process the applications received for revision of pension on higher wages. Sir, Superannuation on 31/03/2017 from NBCC LTD, I am getting pension under EPS 95 FROM MARCH 2015 @ Rs 2145 per month upto December 2016 and onwards @ Rs 2331 per month till December 2018, I want to know that as per latest circular no 22/01/201 pension-1/12/33/96/Amendment/vol 1V /16762 dated 22/01/2019, i would like to know that can i deposit an additional contribution into the pension fund @ 1.16% of salary exceeding Rs15000 from and out of contributions payable by the employees for each month and also to process my application through our department or through EPFO. Is it applicable for employees retired in 2012 ?